If like me, you travel with your dog, you’ll know the challenge you sometimes face when visiting a big city. 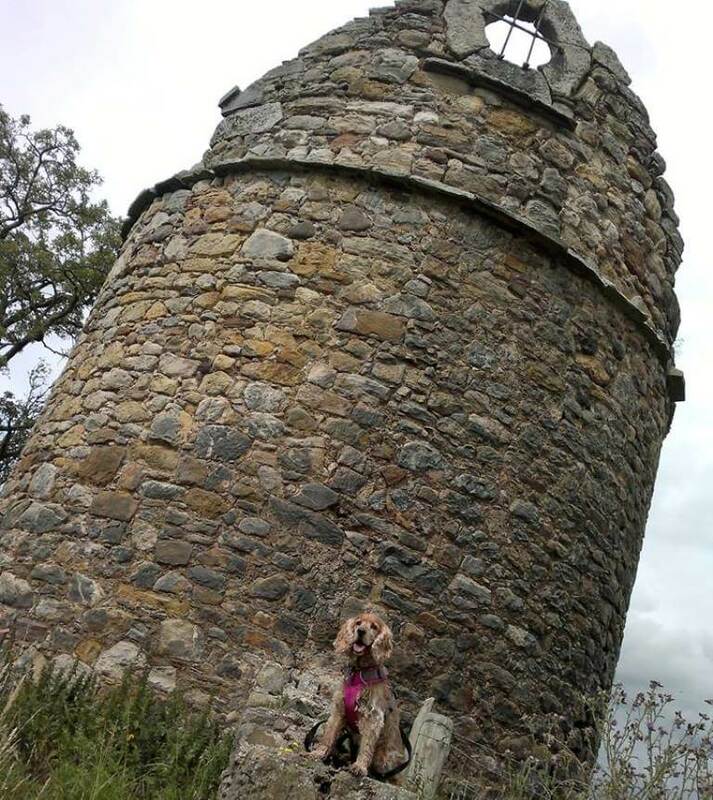 Where can you go that is dog-friendly, what are the doggy laws and etiquettes in the region and where are the green spaces? 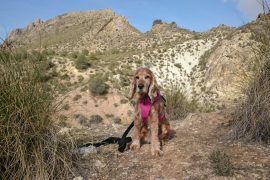 If you are thinking about travelling to Central Scotland and are looking for dog walks in Edinburgh and the surrounds, I hope my MEGA list will give you some inspiration. Even if you are a local, there might be some that you haven’t visited before? Whilst I love the adventures that I am currently on, it doesn’t stop me always looking forward to a visit to my home ‘Toon’. Edinburgh and central Scotland, in general, are full of great history, beautiful architecture and gastronomic delights. It also has some really amazing green spaces. As a dog owner, it is fantastic. This post is dedicated to my two dear departed dogs, Daisy and Sam. 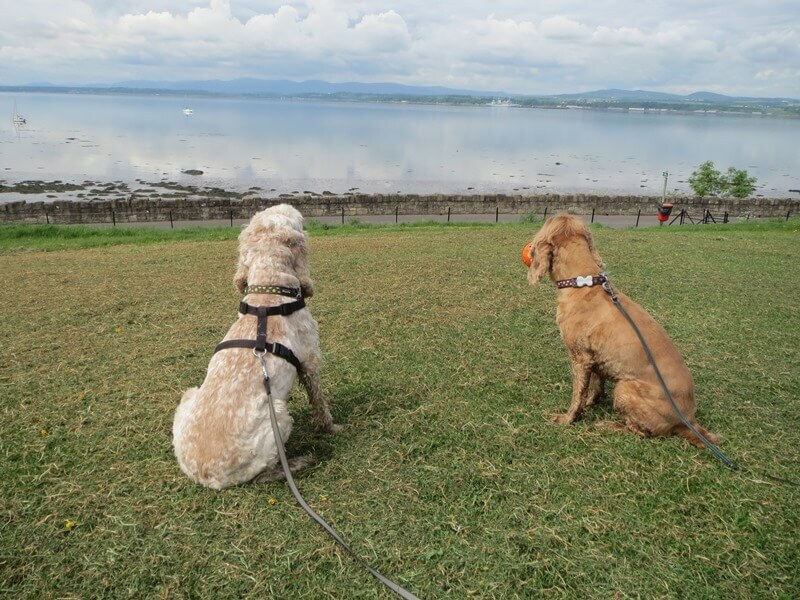 We shared some fantastic dog walks in Edinburgh and beyond, and going through the photos brought a tear to my eye and also evoked some really fond memories. I know I will have missed out some classics, but these are walks I am very familiar with or that stood out as being particularly beautiful or geared up for dogs. 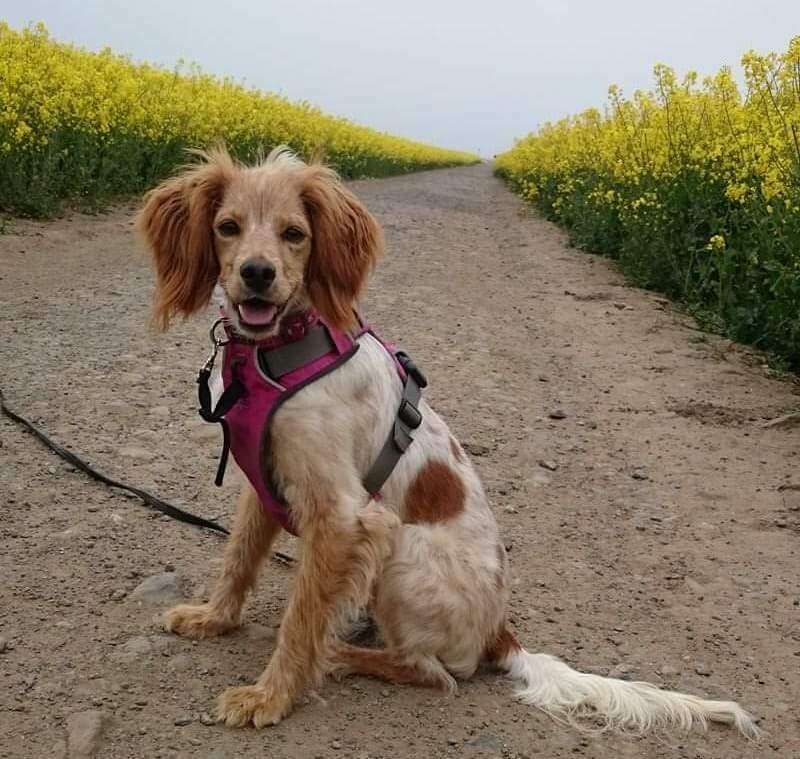 I have split it up into Dog Walks In Edinburgh itself, those just outside the City, and then those that are in Fife, East Lothian and the Scottish Borders. All are still within an hour and halfs driving of Edinburgh maximum. Fancy something a bit longer or further afield? Why not check out my posts on Walking the West Highland Way and Hiking on the Isle of Arran? Oh, and please accept my apologies in advance. 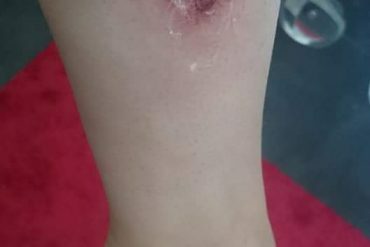 The photos in this post are not up to the usual standard. Most of these walks were done before my passion for photography began. Hopefully the cuteness of Daisy, Sam and Annie will make up for this! Edinburgh really is such a dog-friendly city. There are lots of great doggy shops, beach walks, parks, bars and restaurants. If you are looking for somewhere to enjoy a pint and a bite to eat with your dog, check out the great Dugs N Pubs website. 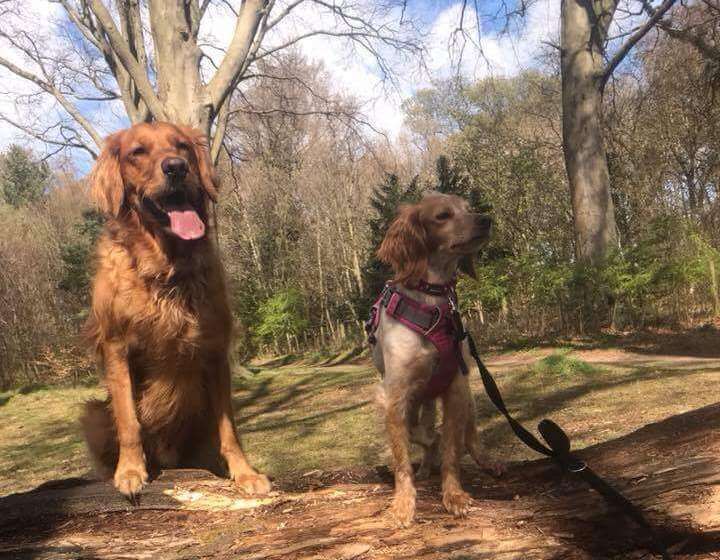 Set up by a doggy loving couple who just had a passion to spread the word on where you can visit with your pooch, it has become a fantastic resource and, I would say, helped Edinburgh develop into the doggy friendly place that it is. Following the river named ‘The Water of Leith’, this walkway is a public footpath that runs from Balerno, a suburb 8 miles from the centre of Edinburgh, all the way to Leith in the North of the City. In total it is about 12 miles (19.5 km) long. It can be walked in one day but, if you are just looking for a gentle stroll or want to stop and enjoy some of the sights along the way, I have suggested three sections that are worth doing on their own and they can all be done within a few hours. This is my favourite section of the walkway. I lived and worked in Stockbridge for a number of years and this was my daily dog walk. You only walk five minutes from the hustle bustle of the town and you are on a peaceful, green and historic pathway. Starting at Stockbridge you follow the path with the signs towards Balerno. You can stop for some photos at St Bernard’s Well. The building itself is only open on special dates. Continue along the walkway, underneath the impressive Dean Bridge and then you will find yourself entering the Dean Village. A delightful, quirky, magical, historical little village. Once home to those that worked in the grain mills, it is now an affluent suburb of Stockbridge, but it really has retained it’s Ye Olde World charm. It is not big, so do take the time to wander the cobbled streets with a mix of higgidly piggidly townhouses and grand old buildings. The old workers building of Wells Court, with its impressive sandstone walls, is also a highlight. If you want to walk on further, another ten or fifteen minutes along the path leads you to the Scottish National Gallery of Modern Art. 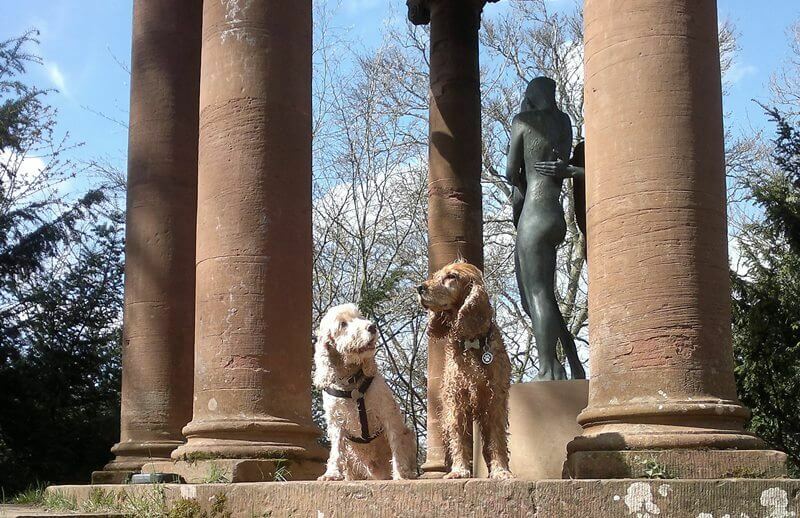 Whilst dogs are not allowed in the Gallery, the grounds are very impressive too. If you want to stock up on doggy supplies you have Just Dogs, my old business, in Stockbridge or you can continue along to the suburb of Roseburn on the walkway and you will find Darren and his Team at House of Hound ready to offer your dog a tasty treat. Stockbridge to Roseburn can be walked in less than an hour. There are plenty of dog-friendly pubs and restaurants in Stockbridge too. Try the Scran and Scallie if you want trendy gastropub food from famed Tom Kitchin or, the Raeburn over the road, who have their own resident Bulldog, Angus, and serve up some delicious cocktails. If you want an even quieter section of the walkway and one that is filled with lovely, green forested trails, why not try the stretch from Colinton out to Balerno. If you are staying in the centre of the town and without a car it is perhaps not as practical as the sections that lead out of Stockbridge, but it is beautiful. It is around 4 and a half miles long, so you could just about manage there and back again if you and your dog/s are feeling up for it. 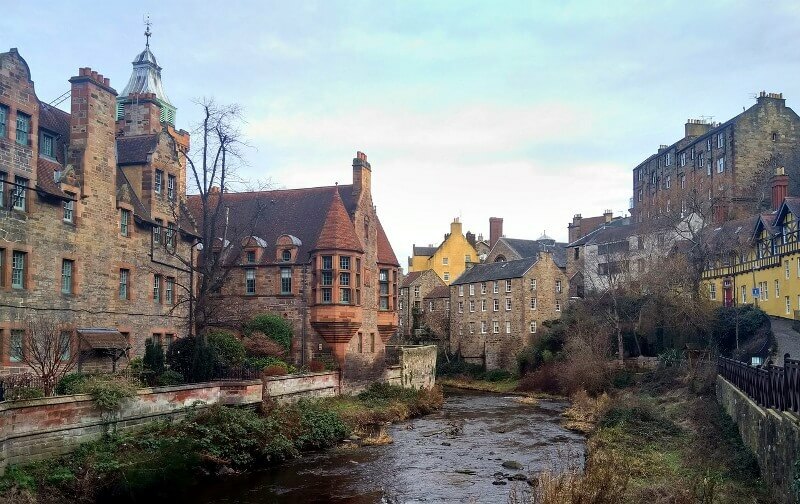 Whilst it is not as beautiful a stretch, in my opinion, as the Dean Village section, this still takes you along some lovely pathways and on reaching the Port of Leith there are plenty pubs to enjoy a refreshment. It is around 3 and a half miles long and can be walked in around an hour and a half. I would suggest allowing 3 hours if you want to do there and back again. If you are looking for an open green space with some great views and a chance to sit back and enjoy a picnic, why not head along to Inverleith Park in Stockbridge. There are always lots of other dogs around too. If you have a dog that is not keen on uninvited attention, it may be best to steer clear but, if they enjoy the company of other dogs, it could be the perfect place to say hello to some doggy friends. If they are off lead, make sure they have a solid recall. Picnic parties and swans in the pond may prove too much of a temptation otherwise! 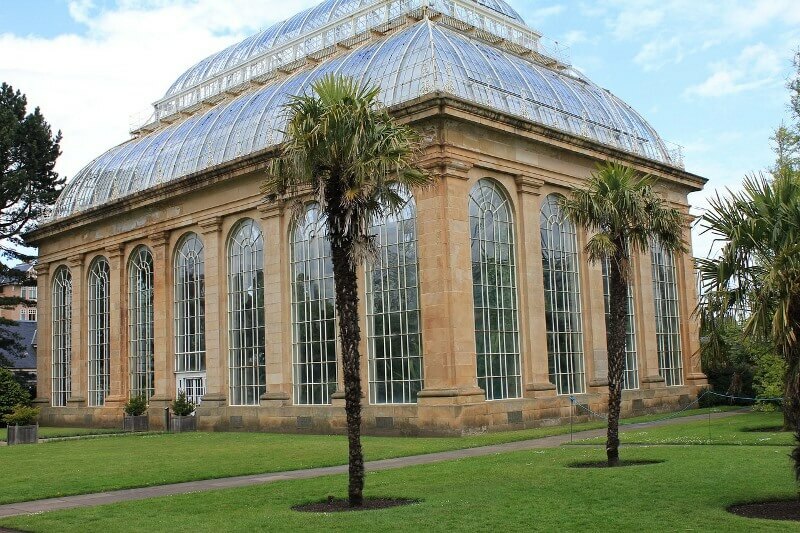 If you are visiting without your dog, take the time to also head through to the Royal Botanic Gardens which are just over the road from the Park and well worth a visit, the hothouses are seriously impressive. 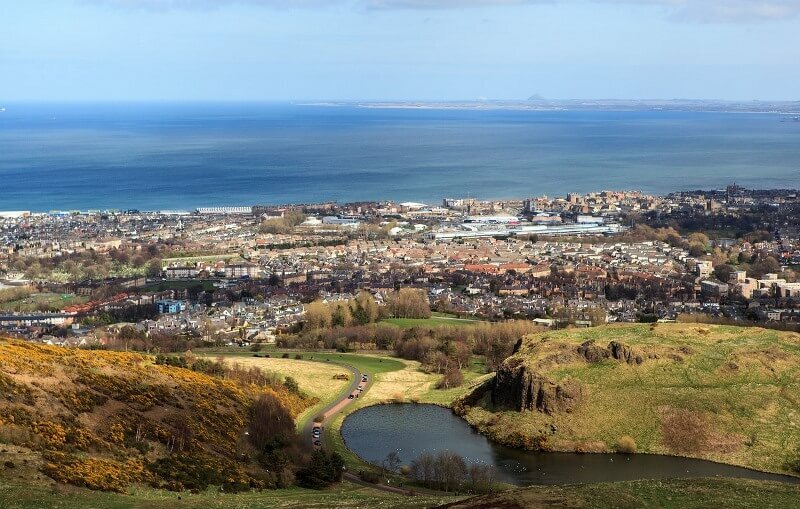 An extinct volcano, some epic city views and a sprawling park. You can’t visit Edinburgh and not take your dog for a walk up Salisbury Crags and Arthur Seat. Holyrood Park is situated at the very bottom of the famous Royal Mile. It also means you will have the chance to view the controversial Scottish Parliament Building and decide whether you think it was worth the astronomically over budget price tag. Head up the Salisbury Crags from the Park and these will take you up and over towards the extinct volcano, Arthur’s Seat. You are afforded some truly spectacular views over the City and beyond, so make sure you choose a clear day. It can be blustery at the top so come armed with warm clothes and comfy footwear unless you strike it lucky with a rare Scottish heat wave! 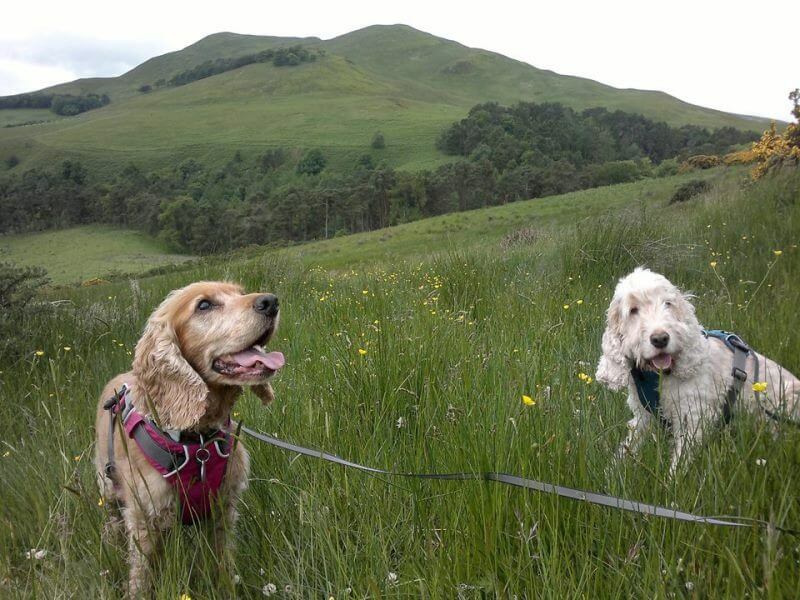 If you and your four-legged friend are not too tired, you can head down the hill towards the Dunsapie Loch and then into the Duddingston Village where you can wet your whistle at the historic Sheep Heid Inn which is, of course, dog-friendly too. If you are looking for somewhere closer to the City Centre for something to eat then I would recommend Hemma at the bottom of Holyrood Road. It is light and airy with healthy, Scandi inspired plates and a good selection of vegan options too. If you have a car and want another walk that offers great views but that is a little quieter than Arthur Seat, then a trip up the Braid Hills may be for you. For a nice circular route that can be done in around two hours, I park in the car park just outside the Stable Bar in Mortonhall Gate (follow the signs for the Mortonhall Camping and Caravan Park). From here, follow the path up to the right of the car park and then onto a well-marked path along the edge of a forest. There is a little pathway up to the Braid Hills near the entrance to the Mortonhall Golf Clubhouse. Follow this narrow path up and you will be rewarded with some great city views and beyond to the Firth of Forth at the trig point. Head down the hill via a path that leads to the suburb of Liberton. Turn left here, you will walk along the side of the busy road for just a couple of minutes, and then you will see the entrance back in towards the golf course. Taking this wooded path leads you, eventually, all the way back to Mortonhall. Here you can then pop into the Stable Bar for some comfort food (their macaroni is yummy) and they always provide a bowl of water and a biscuit for your dog! 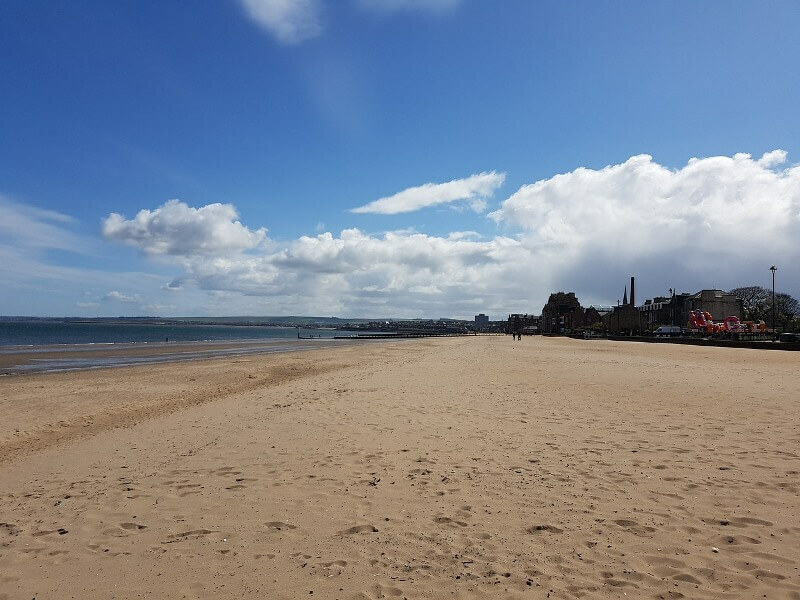 If you want to enjoy some sea breezes but still be close to the city centre then why not head to Portobello. 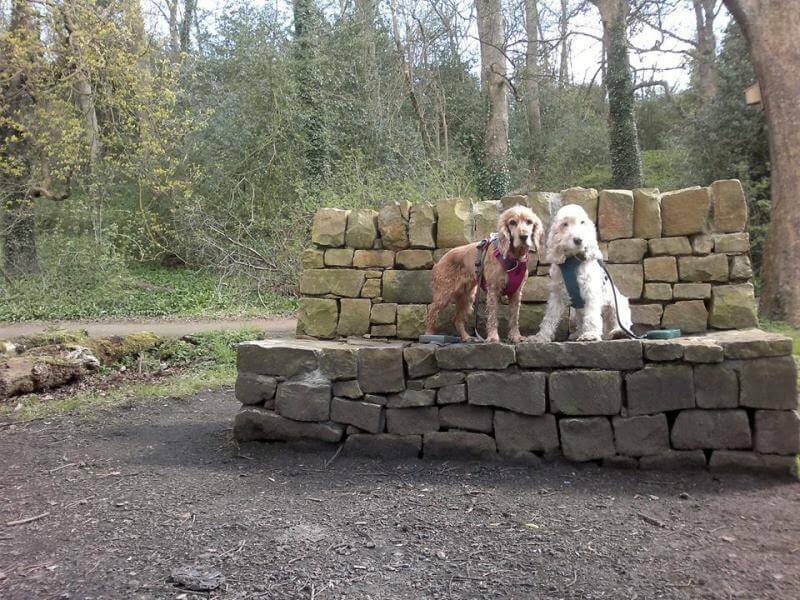 There is a traditional promenade to stroll along, your dog can enjoy a liver muffin cake from Crumbs and you can top up on all your doggy goodies at Harry’s Treat run by lovely Paul and his team. The High Street actually has lots of great independent shops and many do allow well-behaved dogs to pop in too. 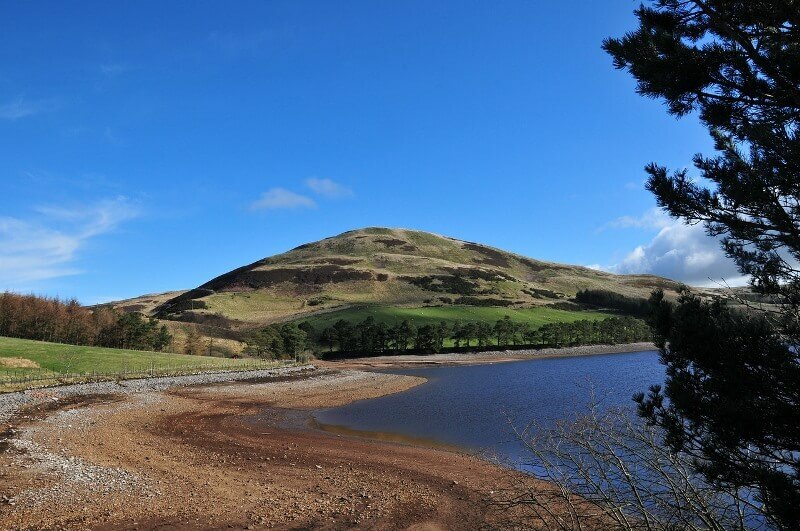 Get out and enjoy some great views and fresh county air with a walk in the Pentlands Hills Regional Park. There are lots of walking trails across the park but two of my favourite walks, and probably most popular, are hiking up Scald Law and having a gentler stroll around the Harlaw and Threipmuir reservoirs. There is ample parking at the Flotterstone entrance to the hills. From here the path to Scald Law, the highest peak in the range at 579m, is well sign-posted. You will cross grazing land so make sure you are respectful and keep your dog on-lead in these areas. To make this into a circular walk, after reaching Scald Law and taking in the fantastic views, you can then head down the hill to walk around the path following the edge of the Loganlea and Glencorse Reservoirs. 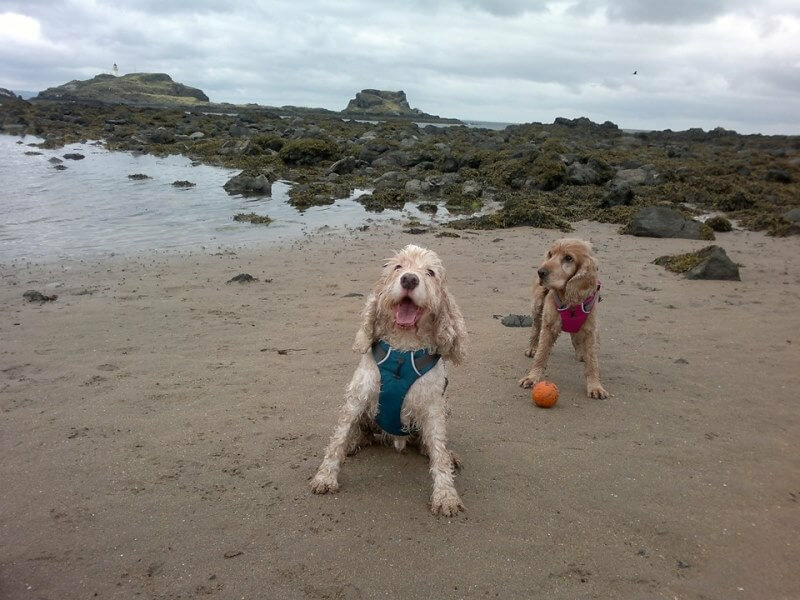 Daisy and Sam are not so bothered about the stunning views, they just want to play with their ball! Once back at Flotterstone, stop in at the Flotterstone Inn for a drink and some tasty pub grub. If it is a nice day you can sit out in their Beer Garden. Another easy access point is from the Edinburgh suburb of Balerno. Access to the car park and trails is along a back road from the village, it is well signposted though. On parking, you follow a woodland trail until you reach the Harlaw Reservoir and this follows a circular route onto the adjoining Threipmuir and back again. It is usually a busier walk than Scald Law but the paths are very easily accessible, buggy appropriate and, if you don’t fancy a hike they are a good alternative as this is a flat walk. 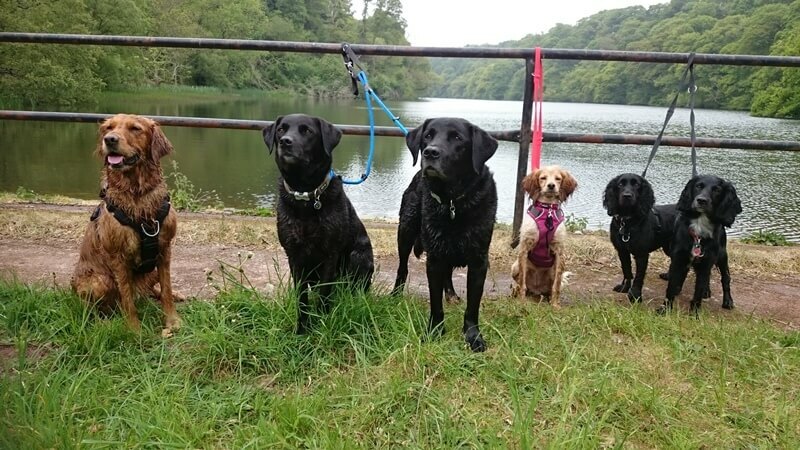 If we have unusually warm summer be aware that toxic blue-green algae can form in the reservoirs and you should not allow your dog access to the water on these occasions. If you are looking for somewhere to stop for a refreshment, the dog-friendly Riccarton Inn in nearby Currie is worth a pit stop. I always get nostalgic when talking about this walk. During my school years, I lived in the village of East Calder, where there is an entrance to the Park, and this was a regular haunt for me. I was lucky to have this on my doorstep as it is a lovely spot with a number of leafy woodland and river walks. 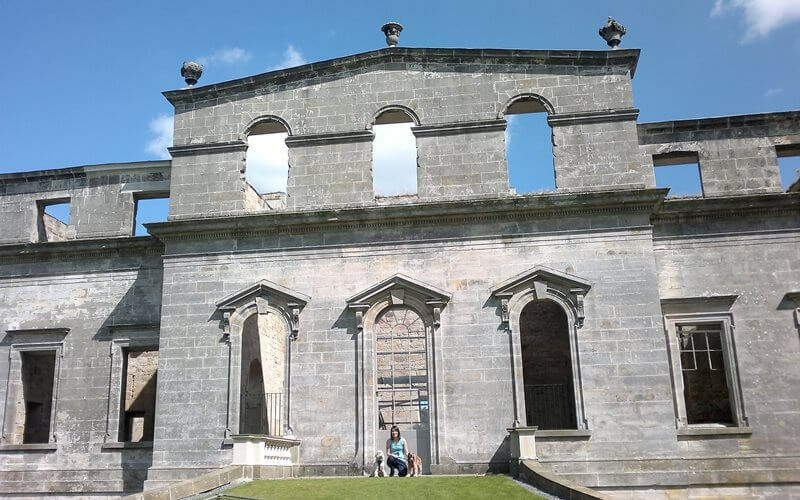 There are plenty of impressive old bridges and aqueducts, lots of picnic spots, a great little park for the kids and there is a little visitors centre if you want to grab a refreshment. There are a few entry points to the park but, my recommendation is from the main street in East Calder. There is a car park just at the entrance and it takes you straight into the woodland walkways before coming down to the river. You can then head right, over the bridge towards the visitors centre, or turn left to come across more lovely old bridges. You can make it a circular walk by crossing at one of the bridges and walking along the paths on either side of the river. I wish I had some photos of the beautiful bridges in the Park but I was too busy taking photos of my dogs! 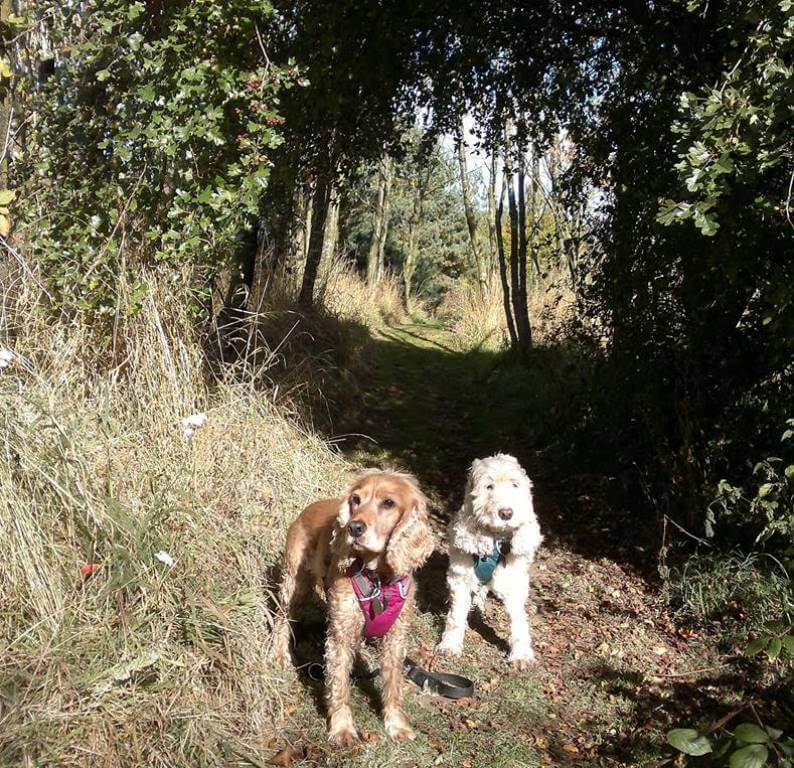 If you are looking to grab a spot of lunch after your walk, the Grapes Pub in East Calder is dog-friendly or, perhaps you could head into the new housing estate just next to the car park to find the Larder at Calderwood. This is a sweet little community cafe and, if it is a nice day, you can bring your dog to their outside seating area to enjoy soup, a panini and some home baking. 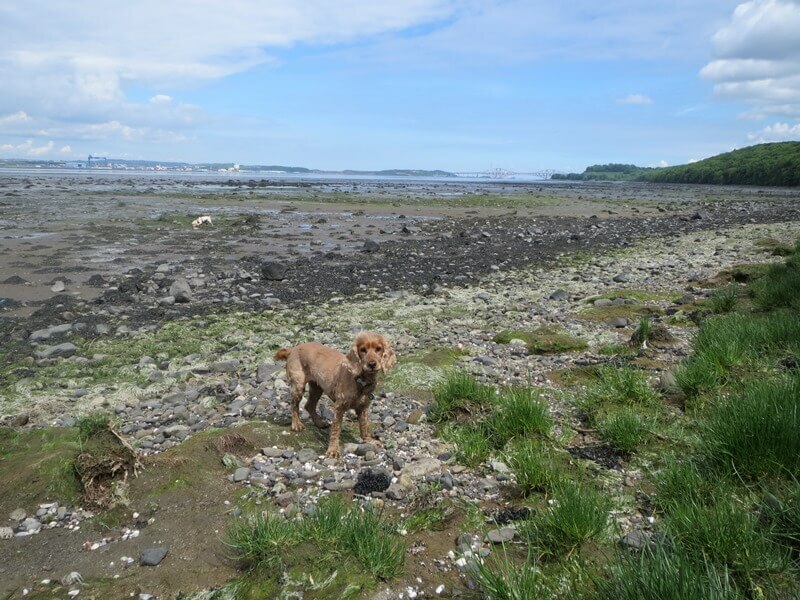 This walk is always very tranquil, it is great if you have a dog that likes their own space, and there are lots of different trail options and great views of the bridges. Abercorn Village is a little hamlet tucked away in a peaceful spot next to the Firth of Forth, just outside the Hopetoun Estate. It has a lovely little Church and is surrounded by leafy green woodland. There is a gate leading onto the woodland path just before the entrance to the churchyard on your left. 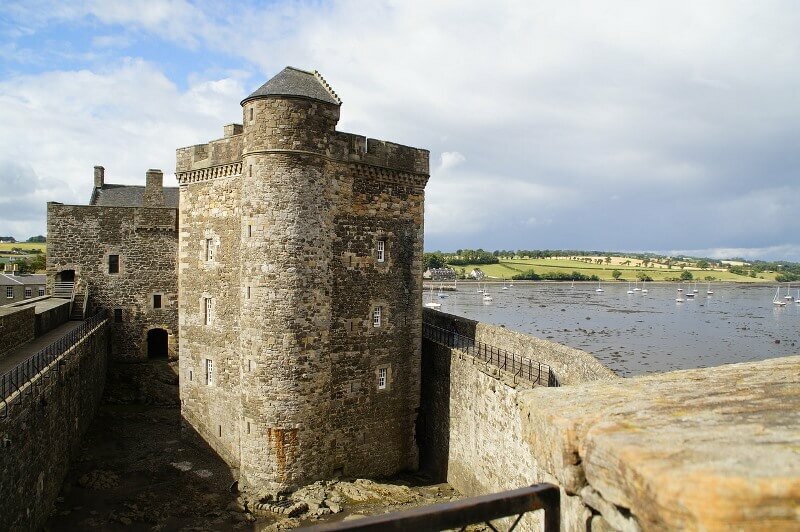 Follow the path down and you will cross a bridge and the trail continues pretty much all the way to Blackness Castle. You can cut into the beach at any time. It is not really a building-a-sandcastle kind of beach, it can get quite muddy when the tide goes out. It is great for shell hunting though. It is a there and back again walk and usually takes a few hours. There is also the option of having a walk around the Hopetoun Estate if you would prefer this. After following the path down from Abercorn Village, instead of turning left to go over the bridge, there is a path to the right that takes you into the Grounds of the Estate. Do be aware that there are often grazing livestock, so you should keep your dog on-lead. If you are a fan of the TV series Outlander, the grounds have been frequently used for filming and Midhope Castle on the Estate is the external location of ‘Lallybroch’. This is another extremely peaceful walk in Mid Lothian, just outside of Loanhead. The house itself is in derelict condition and has been fenced off due to structural issues, but the grounds around it are lovely and it is always quiet with lots of off-lead opportunities. Clambering up to the ruined Doocot affords some lovely views and good photo opportunities. Mavisbank can be tricky to find so I have provided a bit of additional direction info. If you follow Kevock Road (the road down to the Riding Stables) on the outskirts of Lasswade you will come across a signpost for a footpath to Polton and Springfield Mill. Follow the path down to the riverside and then you will see signs for Mavisbank House. 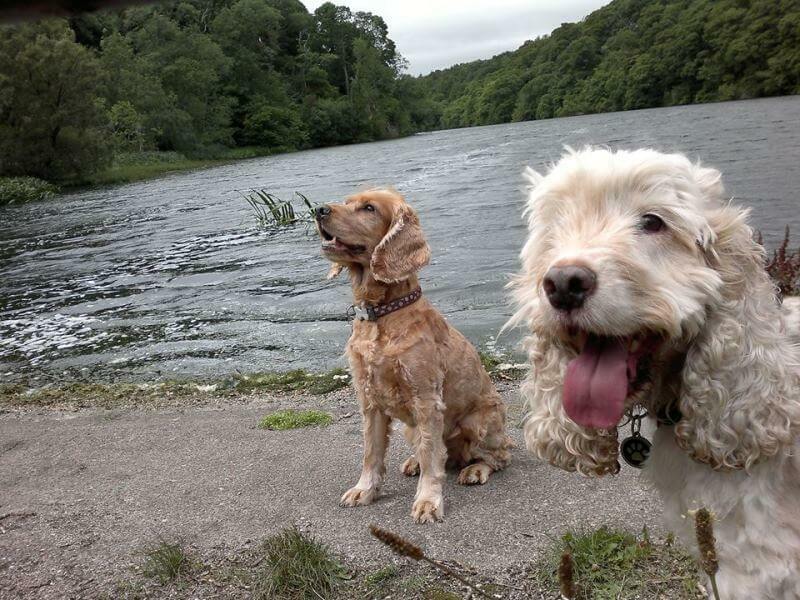 The dog-friendly Paper Mill in nearby Lasswade is an ideal stop for some snacks and refreshments afterwards. The Penicuik House Estate is another Mid Lothian walk that offers lots of lovely little woodland trails, wildlife and interesting historical structures. Be aware though that some areas of the Estate have fields of livestock so off lead walking is not possible in all parts of the grounds. One of my favourite walks and, if you have the time and inclination to head into the heart of Fife, this is so worth visiting. 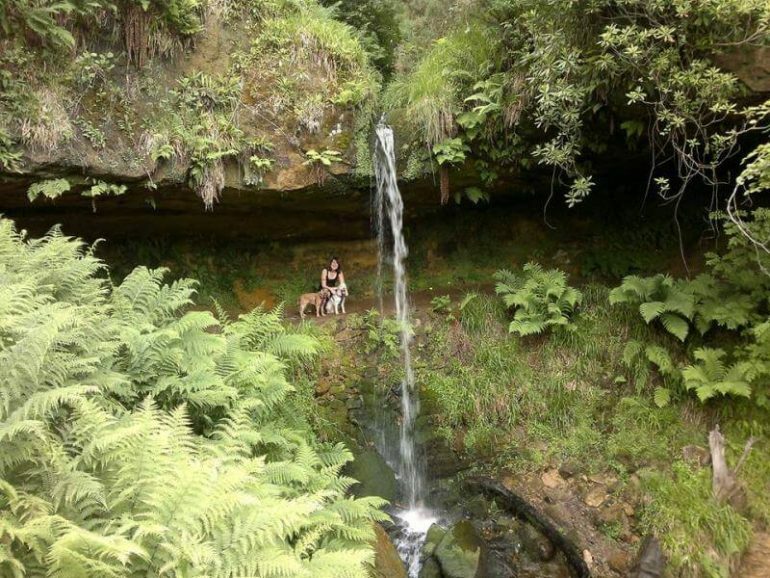 Falkland is a beautiful little village and the Mapsie Den paths have great views, some lovely waterfalls and lots of quirky discoveries along the trails (we did have to carry Daisy through the really dark stone tunnel as she wasn’t keen on the dark – bless her!). During the summer months when it is green and lush, it is like a little fairy glen at some points. The starting point for the walk is heading up Cross Wynd just over from the Church in Falkland. You will then come to signs for a private road and the footpath to East Lomond. Be sure to follow the path to the right at the fork in the road to save you going the wrong way and having an extra steep climb. The first time I did this walk I got a bit confused at the next point that was signed for East Lomond. I followed the sign. Don’t! Instead, take the path to the right. It is a leafy, sometimes muddy track with fields and views to Falkland on your right. From here it is relatively straightforward. The paths can be slippy and muddy underfoot in wet weather so make sure that you wear suitable footwear. This is a circular walk and only around 3 miles long but it does have some steep ascents. It can be finished in less than 2 hours. If you are looking for somewhere to stop for lunch after your walk I would recommend the Pillars of Hercules, just outside Falkland. 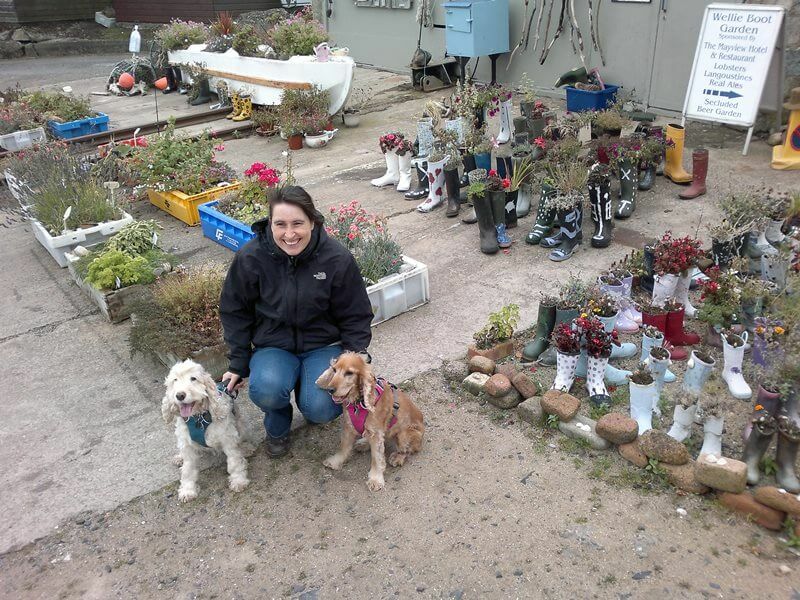 This organic farm shop and cafe is dog-friendly and has delicious home baking too. Even on a rainy day, not uncommon in Scotland, the coastline along the East of Fife is really stunning. If you don’t have a car there are a number of train stops along the route. The walk from St Monan’s to Pittenweem along the Fife Coastal Path is particularly lovely. Lots to see along the way. 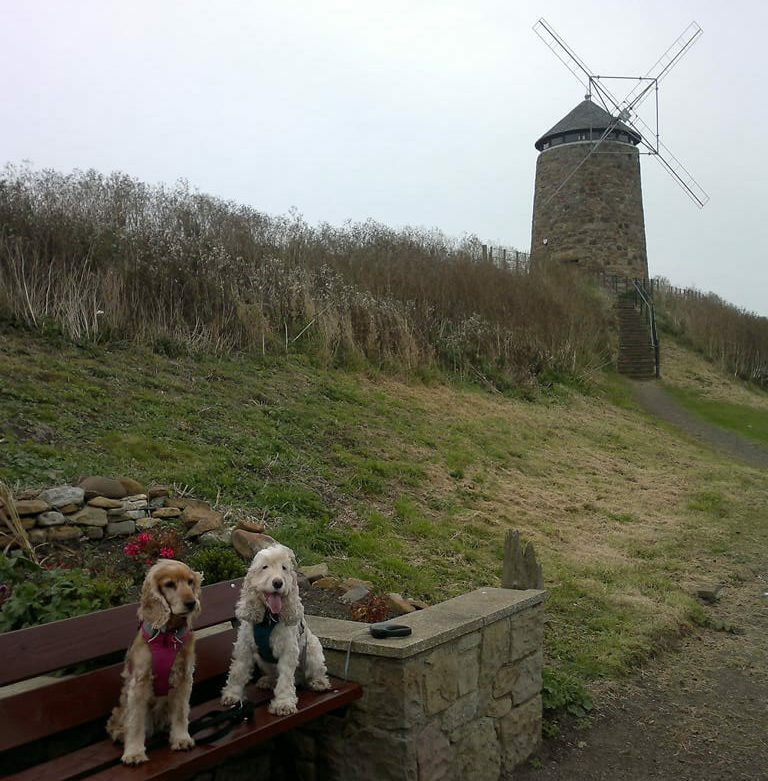 We parked at the Auld Kirk in St Monans and then stopped off for a photo at the Wellie Garden and then the Salt Pans Windmill, it was a bit too cold to dip into the old outdoor saltwater swimming pool though. 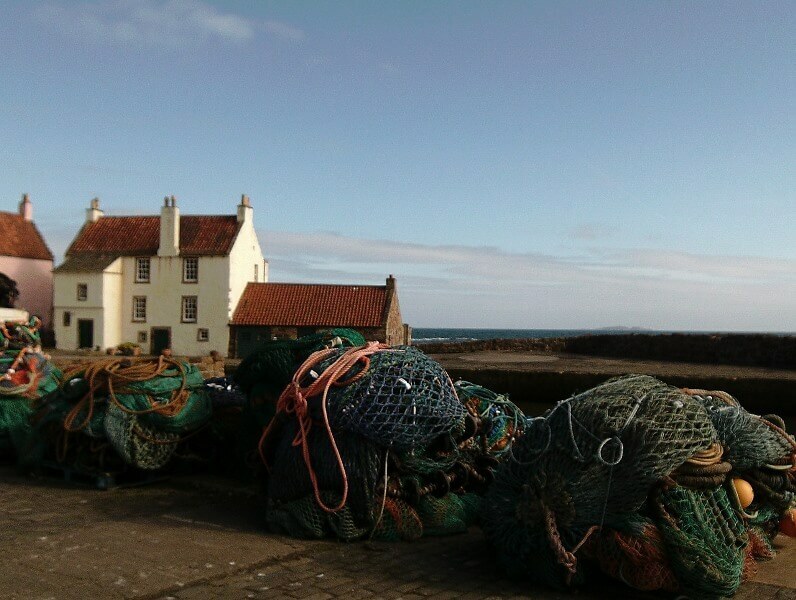 We then made our way along the coast to Pittenweem. 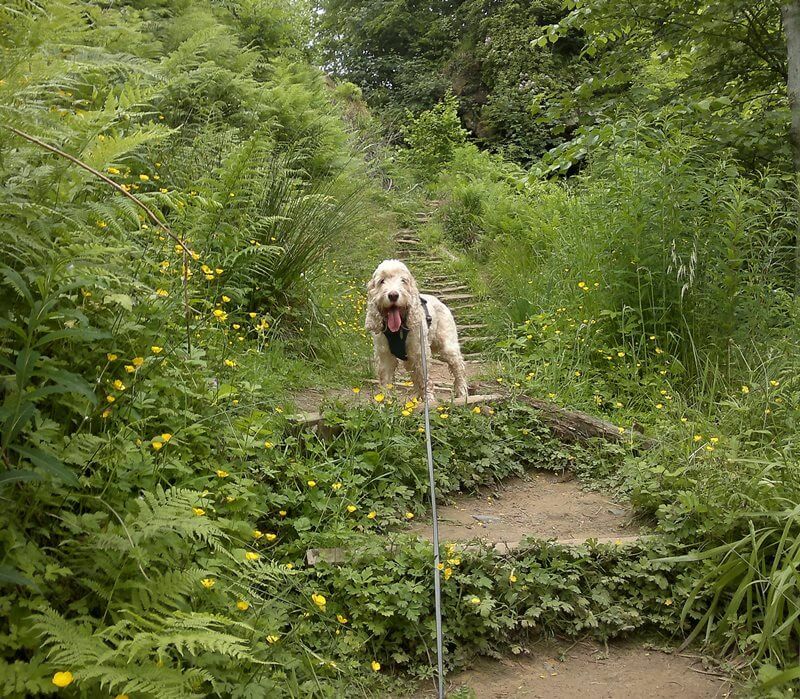 On many parts of the path, it would be best to keep your dog/s on lead as there are some steep drops and cliff erosion. Pittenweem is a lovely village and there are lots of paths to explore, look out for all the many flower bicycles dotted around in the warmer weather. We also visited St Filans Cave (obviously dogs welcome too). We got the key to access the cave from The Cocoa Tree Shop. This is a dog-friendly, Chocolatier and Cafe – yum! The coastal trail continues on next to Anstruther so for those of you looking for a longer walk there is plenty chance for this. The walk we did was just long enough for Daisy’s wee old legs at the time. There and back again was just around 2 hours. I only really discovered Culross (pronounced coo-riss), in Fife, within the last couple of years. I couldn’t believe I hadn’t really known about it before. It is a wonderfully picturesque coastal village steeped in history. One of our favourite walks is along the coastal footpath adjacent to the Village and then heading up into Devilla Forest along to the Plague Graves. 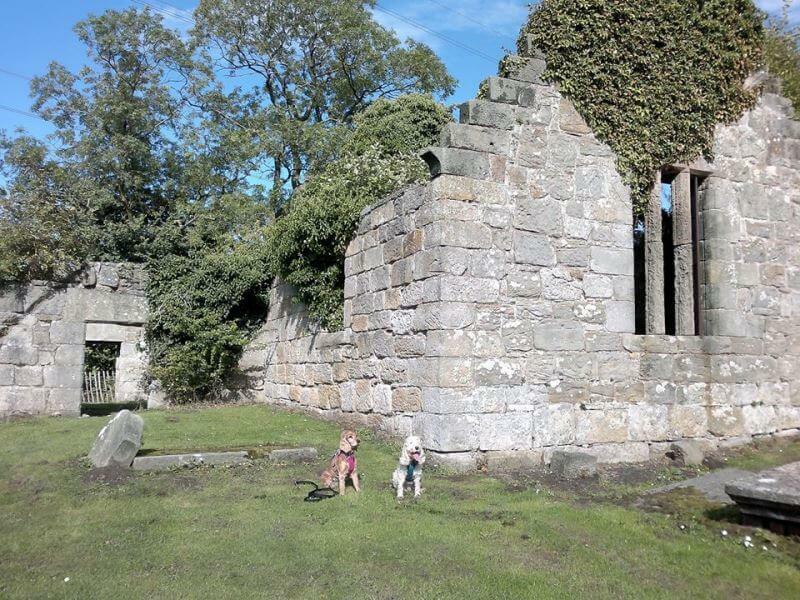 It is a very poignant spot that is said to be the final resting place for three young children from one family who all died on the same day as a result of the Plague in 1645. When we visited, there were some flowers and even some little children’s toys that had been left. You can then follow the trails back to the right, towards the Village again and passed the ruined Kirk which is full of interesting old headstones. Don’t forget to take the time to go right into Culross Village for a wander and head up to the Abbey, a fifteen-minute walk up the top of the hill. Entry is free and dogs are also welcome. The Biscuit Cafe is dog-friendly and there is also a beer garden at the Red Lion Inn. If you plan to go into Devilla Forest, be aware that it can get pretty muddy underfoot! The East Linton to Hailes Castle circular walk is a great option in East Lothian. The path along the River Tyne is lovely and we even spotted a couple of deer on one visit. The ruins of Hailes Castle merit a bit of exploration and dogs are allowed onto the grounds. The village of East Linton itself is worth exploring too and just down the road is Preston Mill, again made famous from scenes in Outlander! One of many great walks in East Lothian and a favourite of mine. Stop in at the Gosford Bothy Farm Shop and pay your £1 to use the car park. It is a bargain, as the Grounds of the Estate really are gorgeous! Gosford House itself is fantastically grand but it is the hidden corners that are the real gems for me. The lily-covered ponds, the wildlife (we have seen brightly coloured dragonflies, herons, bunnies and squirrels) and the quirky old buildings. There is a really unusual curling house, a boathouse, beautiful old trees and just such a calm and relaxing atmosphere. The perfect place to enjoy a picnic. Frustratingly, I don’t have any photos to share. As mentioned, a lot of the walks I am describing were enjoyed before I developed an enthusiasm for photography and blogging! Take my word for it though, it is stunning! For a really peaceful, elevated woodland walk why not head to Pressmennan Woods in East Lothian. It is a little off the beaten track, the car park is along a narrow road from the little village of Stenton but, for me, it is worth the effort. It is always very quiet, the woodland trails are enchanting and you have great views down to Pressmennan Lake and then further beyond. You can even see the famous Bass Rock near North Berwick on a good day. Some of the trails are steep and the paths uneven, so good footwear is suggested. Just enjoy meandering around the forested pathways. A great spot if it is a hot day and you want some shelter for your dog. Bring a picnic if you plan to stay a while as there are no places nearby for a pit stop. 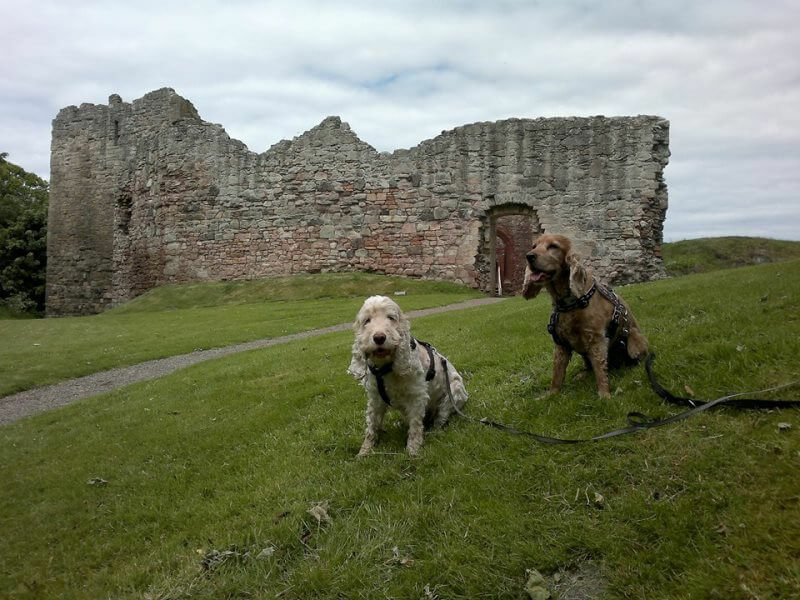 I love Dirleton village and the surrounding countryside and beach walks in East Lothian. If you park in the little car park beside the Castle you can first enjoy a walk down part of the John Muir Trail from the village to access the beach by Fidra Island. It is not a quick walk though, do allow a couple of hours for there and back again. 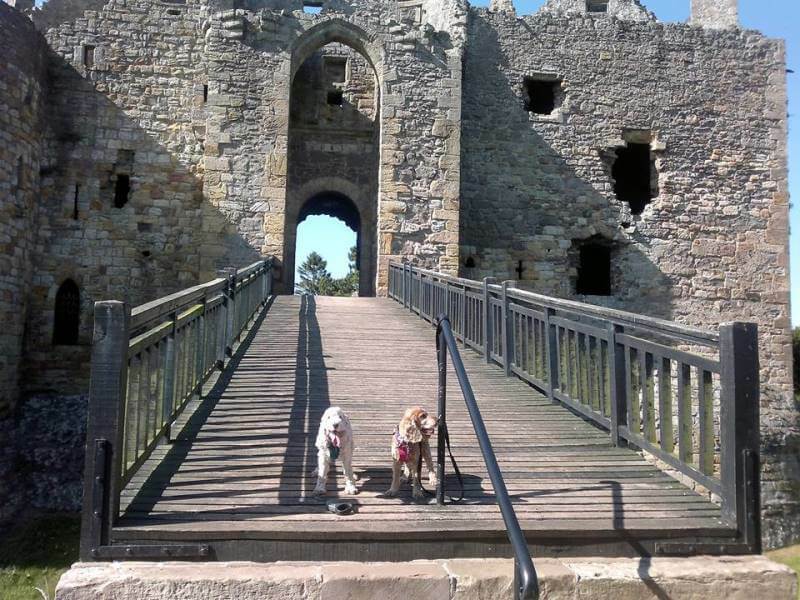 Make sure you allow enough time to explore Dirleton Castle and it’s grounds too. Unusually, given it is paid entry, dogs are allowed in, on-lead of course. Heading down to the coast of the Scottish Borders is a real treat. 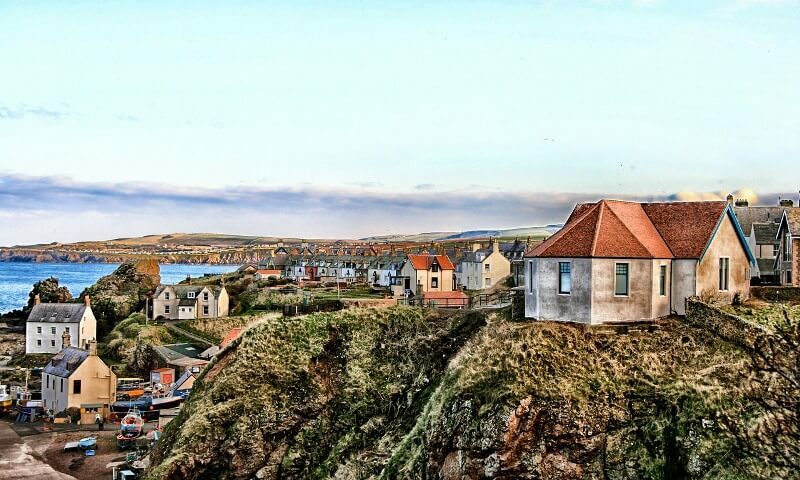 We love the St Abbs and Coldingham area. There is a circular walk to St Abbs Head and you are can enjoy stunning coastal views, walks along dramatic, jagged cliff edges and you will often see nesting seabird colonies. The trail does go through some livestock fields and we would recommend keeping your dog on lead for the walk along the cliff edge. 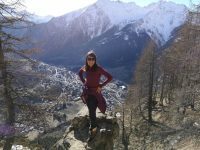 This circular walk is around 4 miles long and, although there are a couple of short climbs, it can be completed in under 2 hours. 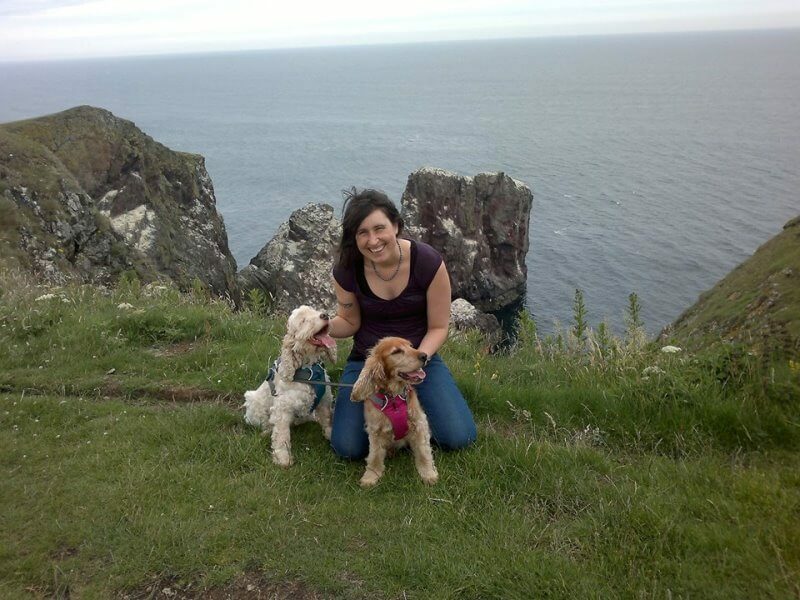 There are a couple of doggy friendly pit stops in St Abbs itself too. Along with the Mapsie Den walk, this is probably my other most favourite walk of all those I have mentioned. There are lots of historical sights along the way and the path along the river is beautiful. St Boswells is a really quaint village located on the River Tweed in the Scottish Borders. From Hamilton Place in the village, you will see signs for the St Cuthberts Way, a 100-kilometre walking trail from Melrose in the Scottish Borders to Lindisfarne in Northumberland in England, and you should follow these. After crossing the large green suspension bridge you can choose to do a slight detour if you want to visit the Temple of the Muses. The temple was built in 1817 but the original statue no longer stands there and there is now a modern, but still very impressive, statue that was made by local artist Siobhan O’Hehir. Further along the path, there is also a trail leading to a giant 31-foot statue of William Wallace. 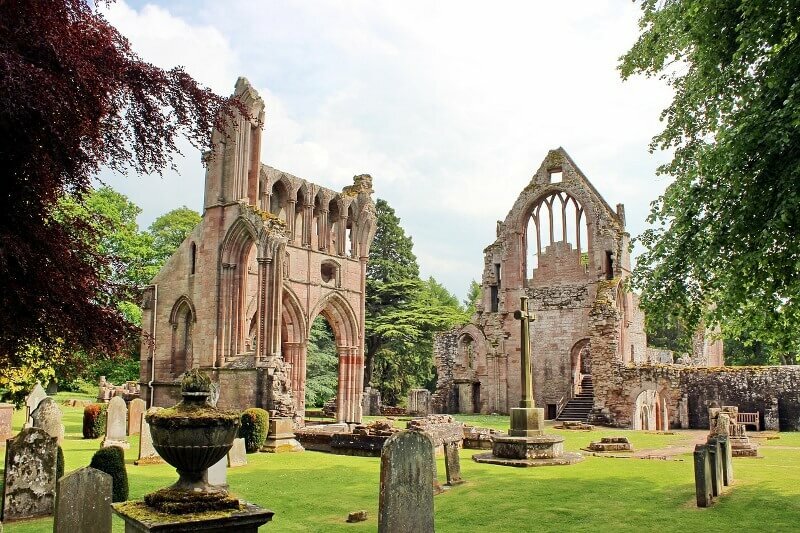 You then continue along the path to the ruins of Dryburgh Abbey. Dogs are allowed in the grounds, on-lead, but are not allowed access to the roofed areas. The walk is around five miles long and can be completed in under 3 hours, even allowing for some stops along the way. 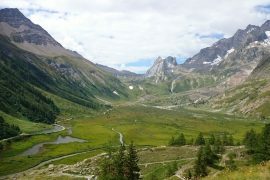 It is not a circular walk so you do have to do there and back again, but when the views are so lovely it is no hardship! 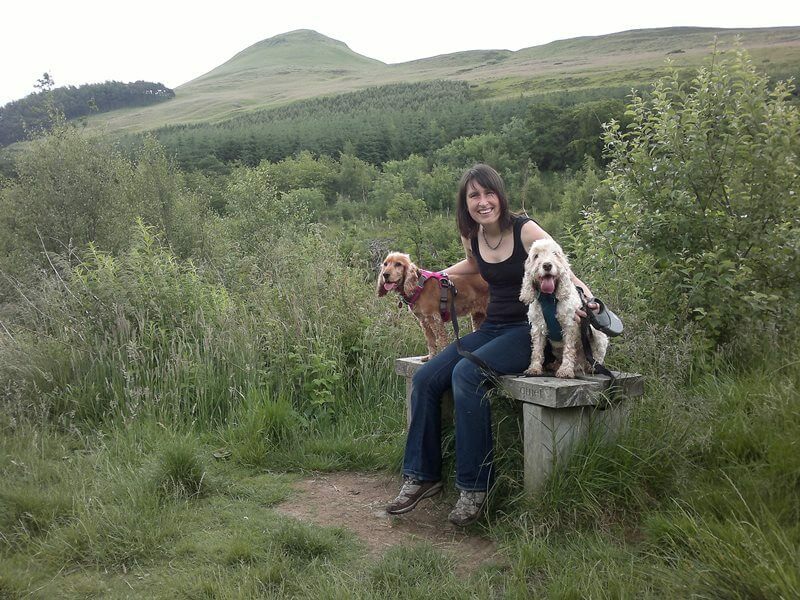 I would love to hear about your suggested dog walks in Edinburgh and surrounds. If you have any photos of your dogs enjoying any of the walks mentioned above that you would like to share that would be fab too. 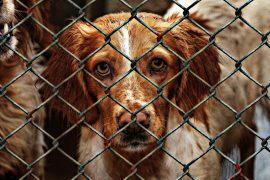 The Tragic Plight of Galgos & Spanish Hunting Dogs: Is There Hope on the Horizon? fantastic, there were some I didn’t know so Taras in for a treat !